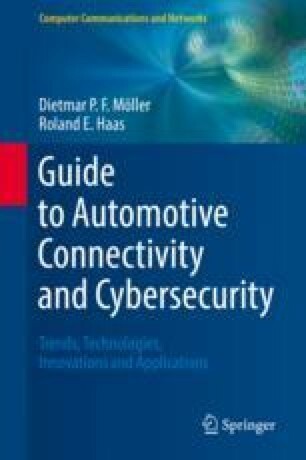 This chapter introduces the key technologies essential for the evolution of connected cars. Section 5.1 introduces cyber-physical systems (CPS) and describes engineered systems that integrate computing and networking technologies. The cyber part of CPS is deeply embedded in and interacts with physical processes, the physical components. Section 5.2 presents the concept of the Internet of Things (IoT) with regard to its communication capabilities anytime, from anywhere, with everything and key object radio-frequency identification (RFID) technology, which enables objects, things, or entities to be connected wirelessly. Section 5.3 focuses on telematics, infotainment, and the evolution of the connected car, taking into account technology maturity levels, driving factors, and business models of connected cars. Section 5.4 refers to platforms and architectures with regard to connected cars as well as the connected car reference platform and the connected car in the cloud. Section 5.5 introduces autonomous vehicles with regard to the respective guidelines for the testing and deployment of autonomous vehicles published by the National Highway Traffic Safety Administration (NHTSA). In Sect. 5.6, the GENIVI Alliance®, essential for the telematic and infotainment components, is introduced. Section 5.7 introduces several case studies of specific themes essential for the evolution of the connected car, such as the BMW ConnectedDrive Store, the Mercedes COMAND® Online, and HERE, which provides digital mapping for fully autonomous driving. Section 5.8 contains comprehensive questions for verifying the knowledge gained and finally followed by references and suggestions for further reading.